Size of Male: 30-40 lbs., 15.5–18 in. Size of Female: 25-35 lbs., 14–16.5 in. The Boykin Spaniel is another of the very useful spaniel breeds that has been developed for a specialized purpose. Boykins are small, dark brown spaniels that originated in South Carolina in the early 20th century. They are friendly, intelligent and fall into the “easy” dog training category. They love to be around people, they get along well with other dogs and they love children. They make great little hunting dogs and wonderful family pets. For once, the origin of a breed is well-known and documented. The Boykin Spaniel was created in the early 20th century from a dog named Dumpy. A small dog was found wandering near a Methodist Church in Spartanburg, SC. One of the people attending service at the church (Mr. Alexander White) took the little dog home as a pet. However, Mr. White noticed, in some way, that the dog had some hunting ability. Mr. White sent the dog to his hunting partner, Mr. L. Whitaker Boykin, in Boykin, SC, just outside Camden, SC. Mr. Boykin soon trained the dog into a super little hunting dog. He excelled as a turkey dog and a waterfowl retriever. 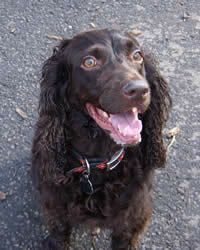 By adding in some Chesapeake Bay Retriever, Cocker Spaniel, American Water Spaniel and Springer Spaniel, the Boykin dog breed was created, all based on Dumpy’s abilities. Like many other spaniels, the Boykin Spaniel is a friendly dog who loves to be around people. He is intelligent and easy to train. These dogs get along well with other dogs and household pets. They also love children. Boykins are very sociable small dogs who do best in a family environment. They do love to have lots of outdoor activity and they are energetic, so it’s best if they have an owner who will provide them with lots of exercise. They are very eager to please. The hunting instinct is very strong in these little dogs. They are ideal for anyone who wants both a hunting dog and a family pet. This spaniel dog breed is unlikely to make a good guard dog since they are usually quite friendly to people. Living Environment – The Boykin Spaniel could possibly adapt to living in an apartment but it would be difficult. These are very energetic little dogs and they need lots of daily exercise. Their size would make apartment living acceptable but they really need access to the outdoors. They do not do well as kennel dogs since they must live with people. These dogs generally enjoy warm weather since the breed was created in the southern United States and they are well-adapted for warm, humid weather. Grooming – Grooming for the Boykin Spaniel is not difficult. They typically have a shorter, lighter coat than most spaniels. Many owners keep it short, especially if the dog is going to be used in the field. The coat can range from flat to slightly wavy. Brush the coat regularly and bathe as necessary. You can trim around the head, throat, ears and paws to make the dog look neater. Diet & Exercise – Boykins have normal dietary needs. This dog breed does require a great deal of daily exercise. They are very energetic dogs and running may not meet his needs. It’s best if your dog can participate in activities that will allow him to use his mind and his body. Health – Boykins are prone to canine hip dysplasia and you should talk to breeders about OFA certification of the parents for any puppy you are interested in getting. The breed can also have dog eye problems, luxating patellas (slipped kneecaps), thyroid and endocrine disorders, cardiac issues, elbow dysplasia, and exercise induced collapse. Some of these health issues occur only rarely but if you are interested in this dog breed, you should talk to a breeder about dog health problems in the breed. When it comes to dog training, Boykin Spaniels are intelligent dogs and they are considered easy to train. They are very eager to please which makes training them much easier. Spaniels in general can be somewhat sensitive so it’s best to use positive dog training methods (praise, reward). If you use these methods you should have no trouble training your dog.